150ft of high quality Video/Power Premade Siamese Cable that supports up to HD 1080P signals when used with HD over coax cameras like HDCVI cameras. It can also be used with regular analog CCTV cameras, add-on mics, and any other CCTV product that has a BNC video connection and 12V DC 2.1mm jack. Can this be used with a HD over coax PTZ camera? Sorry you cannot use premade siamese cable to operate PTZ cameras. You will need solid copper RG59 coax cable. Can this be exposed to the outside elements or requires conduit for outside runs? 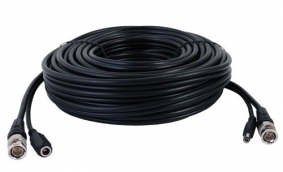 You can use premade cabling outside as long as it is not submerged in water along any length of the cable. For example, you can have it running on vertical surfaces where water will drain off the cable.